Go ahead and remove the corn husks and as much of the silk as you can. Use a soft vegetable brush to brush off more of the silks. Don’t drive yourself crazy here. A few silks isn’t going to hurt anything. Fill a large stockpot 2/3 full with water. Bring to a hard boil. Get a large bowl of water and fill it 2/3 full with very icy water. Place several ears of corn in the pot and cover with a lid. Cook 4 to 6 minutes. Please note that your water should return to a boil within 1 minute. 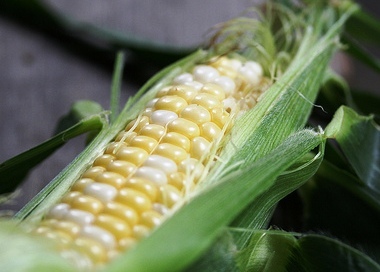 If it is not returning to a boil within a minute you are adding too many ears of corn. 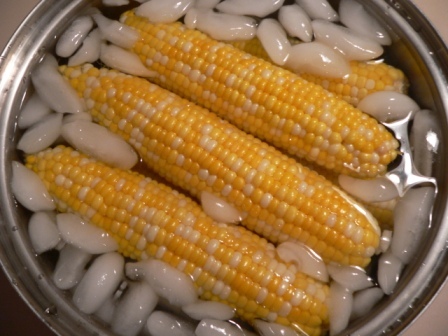 Plunge the ears of corn into ice water. Keep the ears submerged for 4 to 6 minutes. Add more ice as needed. 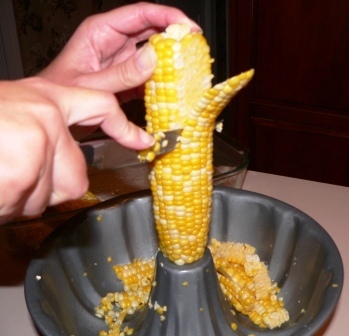 Stick the ear of the corn in the center of a bundt pan and cut the corn off the cob. The kernels will fall into the bowl. 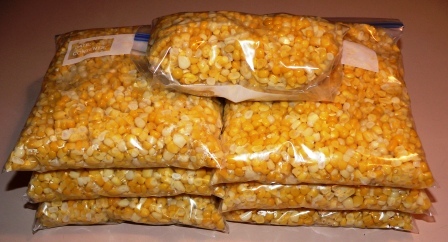 I filled quart size freezer bags with approximately 4 cups of corn each. Squeeze out as much air as you can and seal the bags. Label the bags and pop them in the freezer. Your corn does not need to be cooked. Just warm it to your liking. It is fabulous in this Fresh Summer Corn Salad. « Grass-Fed Beef $4.99 at Whole Foods this Friday! Thanks so much for sharing this instructive post at FAT TUESDAY! I hope to see you next week! THIS IS SOOOOOO COOL!!!!!! AMAZING IDEA! THANKS 4 LINKING UP AT WONKA WEDNESDAY! With so many folks returning to preserving food, this is a great tutorial. Thanks for sharing with the Hearth and Soul hop. Good tutorial! Thanks for sharing it. thank you for sharing your tutorial with the Hearth and soul Hop. I wish my garden produced enough corn for me to put it to use! I never froze corn. I always buy it frozen and I think I need to go and buy some fresh corn at the fruit stand next door and freeze it. My kids love corn and I am pretty sure this is so much better then the grocery store frozen corn. Oh my gosh! It’s so much easier to cut it off the cob before blanching! I’ve converted many a friend/family member and they all agree! Thanks Jess! I’ll try that next time. So do you boil the kernels and then strain them?